Colonel Benjamin Henry Grierson and Fort Davis. I should state, from the outset, that it was my wife’s idea. While I had heard of the town of Fort Davis, I had never been there. Nevertheless, last summer, when my wife and I needed a home-base while doing some research for the book I was writing, she scoured our much used and frail map of Texas and chose Fort Davis for its central location (to that area of the state we were exploring) and small size. When we arrived one warm and bright afternoon early in July, we were both amazed by the beauty of the place. Because the town is literally a “mile-high”, the environment holds a distinct juxtaposition to the rest of the surrounding west Texas desert. While Marfa, Marathon and Terlingua all radiate an aura of dust and heat, Fort Davis exudes a cooler, even floral animus; even in July a sweater is needed in the evenings. However, even more interesting was the history of the place. The territory’s rich climate has drawn human activity for, well, a helluva long time. The Native American pictograms that adorn the rocks and cave walls throughout the area give evidence of this. The first American settlers began to drive their cattle into this fecund land in the late nineteenth century, at the end of the American Civil War. By the 1870s the violence that the Native Americans (mainly Mescalero Apache and Comanche tribes) and the new settlers were hurling at each other warranted intervention by the United States government. Military forts were established as protection for the stage lines, the mail routes, the railroads and, of course, those early settlers who chose to try to scrape out a living amongst all of the chaos that permeated the territory. A peculiar lawlessness pervaded this section of the country at this time. If you couple the inherent violence that persisted in the region after the Civil war with the Indian “depredations”, the early residents had to sacrifice personal safety for the quality of the land they had chosen. Clearly, a military presence was needed if any claim to permanency was to be hoped for or even expected. Fort Davis, the actual fort, not the town, was garrisoned twice; once ante bellum and then again, post bellum. It is the second effort that is the more successful and historical. The famous “Buffalo Soldiers” completed the second occupation of the fort. And, it is the person and family of Colonel B.H. 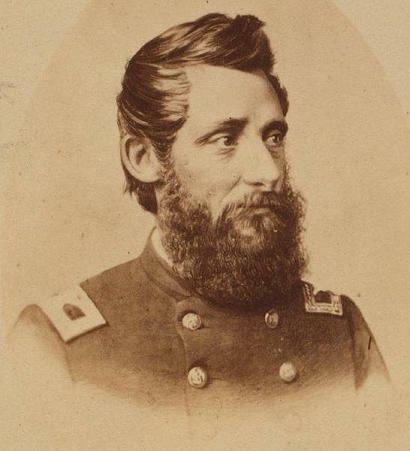 (Benjamin Henry) Grierson, the commander of the Tenth United States Cavalry at Ft. Davis, who exemplify the renowned history of the territory. B.H. Grierson was born in Pittsburg, Pennsylvania in 1826. His family soon moved to Illinois, by way of Ohio, and there, as a young man, Grierson developed an eager interest in music. Indeed, before undertaking a military career (at his wife, Alice’s instigation-a military job offering a larger, more reliable paycheck than teaching) Grierson had been a music teacher and even composed a campaign song for Illinois presidential candidate Abraham Lincoln in 1860. The tune was titled, stoically, ‘Campaign Song’. The Civil War offered Grierson the opportunity to begin that military service that he and his wife had discussed. Rising through the ranks quickly, he “…rose from volunteer aide to major general of volunteers.”1 And so it was that in the spring of 1863 Grierson was ordered on a campaign that would both promote his worth within the army and earn him national notoriety. After the war Grierson, now a colonel in the regular army, established the Tenth United States Cavalry comprised, chiefly of African American soldiers and their white officers. In 1869 he chose the site for and was in command of Fort Sill in Oklahoma until 1872. Soon Grierson was assigned as commander of Fort Davis. It was a location that suited him and he foresaw the potential in the land. He began to purchase large sections of west Texas property. In part he envisioned the United States government needing space to expand the fort and in other regards he and his wife wanted to offer their two younger sons, Harry (Benjamin Jr.) and George, a livelihood that did not necessitate a university’s challenges. Their two older sons, Charles and Robert, the former a West Point graduate who had served under his father, the latter a medical school student, had both succumbed to a devastating mental illness that incapacitated the both of them and required institutionalization for the remainder of their lives. The assignment to Fort Davis should have been relatively calm. 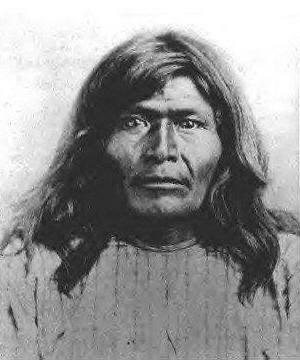 However, the Mescalero Apache chief Victorio saw to it that Grierson and his soldiers remained active. Victorio led raids throughout Texas, New Mexico and Mexico from 1877-1880 while Grierson and several other American and Mexican authorities chased and hounded him throughout the Trans-Pecos and Big Bend areas. In July of 1880, Grierson, his son Robert (just out of high school) and a small contingent of officers and enlisted men, engaged close to one hundred of Victorio’s warriors in the south Texas desert. This skirmish, now called the ‘Battle of Tenaja de las Palmas, resulted in seven dead Apaches, many more wounded and a single soldier killed when his mount was shot from beneath him and he could not outrun the marauding Apaches. Although the battle had small effect on Victorio’s abilities to continue his depredations it did mark Grierson as Victorio’s equal in strategic, military maneuvering; Grierson had known exactly where Victorio was headed that day and had lain in wait for him. It was the first firefight Grierson had encountered since his Civil War days. Although Victorio was killed later that same year by Mexican troops, Grierson’s unrelenting and oftentimes cunning pursuit of the renegade chief only augmented an already prestigious military notoriety. The Tenth Cavalry was transferred to Arizona in 1885. With Charles hospitalized, B.H. and Alice Grierson, along with the troops, moved to Arizona. 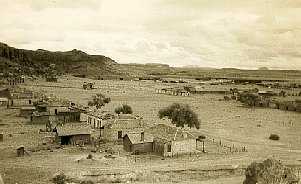 The sons Robert, Harry and George stayed in Fort Davis both because the family held such large plats of land in the area and also because the boys had become fixtures in the community. Indeed, their large ranch home, named Spring Valley Ranch, had been one of the larger homes in the area and many local residents were employed in and around the ranch (Evidently, the Grierson brothers were not experienced cowboys and needed a great deal of help taking care of their cattle and property). In June of 1889, while Robert Grierson was County Commissioner, County Treasurer George Geegee stole and rode off with the $40,000 in bond monies entrusted to his keeping. He literally took flight in the middle of the night and was never found. Strangely, his wife remained in the Fort Davis area for several more years, all the while denying any knowledge of her husband’s whereabouts. During the subsequent town meeting, Robert Grierson, when he realized that he and a few others who had signed for the bond money, would be responsible for its repayment, “…became completely unbalanced and violent.”2 The infamous Grierson mental illness had returned with a vengeance. His brother Harry had to restrain him and then traveled with him to Illinois where he was placed in an asylum that would be his home for the rest of his life. After this, Harry and George found themselves in Fort Davis by themselves. Their beloved mother, Alice, had passed away in 1888. In 1897 B.H. Grierson remarried. The boys’ new stepmother, Lillian King, was not well liked and the animosity strained the boys’ relationship with their father. Soon, Harry and George were, in most regards, left in Fort Davis alone. Indeed, Harry was more alone than the pair of them as George, “ …was probably somewhat retarded. He became more and more eccentric the older he became. Harry literally had the care of him.”2 Harry’s marriage in 1922, because George could not stand his brother’s attentions being slanted in any direction other than his own, ended in divorce just a few years later. In 1935 George had his sanity issue cleared and he returned, incredulously, to Fort Davis where he lived the remainder of his life, “…as an eccentric recluse.” Most likely, he had nowhere else to go. George Grierson died in 1950 and with his passing the legacy that had been the Grierson name in the Fort Davis area passed with him. His father, Colonel B.H. Grierson had not been a popular individual in the area while he lived there. He was infamous for his use of profanity and his stern leadership qualities did not endear him to his soldiers. Nevertheless, his military prowess did clear the territory for those settlers who wanted to move into Jeff Davis County. Harry Grierson, in contrast, was well liked in Fort Davis. An accomplished musician, like his father before him, Harry read constantly and demonstrated keen interests in any number of subjects. In fact, after reading about architecture and engineering, he designed and had built a couple of bridges in Jeff Davis County. Again, Jacobson and Nored remark that one of these bridges, called the Rainbow Bridge, which was built on the old fort’s property, was still in use at the time of their book’s publication in 1993. The Grierson family left Fort Davis better than they found it. Intelligent, determined and with an eye always on the future the Grierson family became an integral part of the history of the region. Colonel Grierson’s military prowess and individual foresight allowed the territory to be opened for future development. Prior to his arrival and subsequent military action, prospective settlers shied away from the area because of the threat from the Native American tribes. All of those early residents are obliged and indebted to Grierson and his Buffalo Soldiers. Subsequently, the town of Fort Davis owes much to the Grierson family. Decades of accumulated stories and memories have painted the Jeff Davis County canvas with vivid, intriguing images. Much of what Fort Davis is can be attributed to the Grierson name. As usual, my wife had a prescient notion about the town. The natural beauty of the place has drawn many into the town’s embrace for generations and certainly we were no different. That the region’s history is so studded with tales such as the Grierson’s only augments an already brilliant narrative. Leave it to my wife to locate such a wonderful place.